Neil deGrasse Tyson is an astrophysicist based at the American Museum of Natural History in New York city. He is the director of the Hayden Planetarium here, and also writes regularly for Natural History museum. It is fair to say then that Tyson not only knows his material, but he also knows how to communicate it skilfully to his audience. And this, his latest book, is an absolute delight to read. 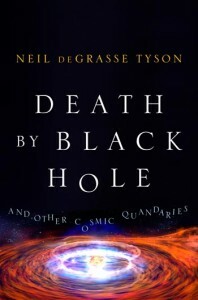 Death by Black Hole is a compendium of articles Tyson has written in Natural History over the last four decades, it’s forty-two chapters organised into seven themed sections. He writes on everything from the methods used in understanding the universe around us, to the interface between science and the public, and the role of religion. The first chapter is particularly well devised, and describes what the heavens would like if our eyes could be retuned to see wavelengths across the electromagnetic spectrum – from the radio-bright galactic core to rare intense flashes of gamma-rays and the microwave glow of the cosmos itself. I found some of the other chapters particularly interesting. Tyson explains, for example, why it takes light around million years to travel from the sun’s core out through the surface — even though the direct distance is only about 2.3 light seconds — and why the sun actually appears slightly smaller if you look at it in infra-red light. Chapter 33 tells us of the eponymous death by black hole, as the intense tidal forces tug differentially at your head and toes and you ultimately expire through ‘spaghettification’. Tyson also displays a more humorous side in a chapter-long rant about the shocking astronomical errors he’s spotted in popular films. Death by Black Hole contains two whole sections of importance to astrobiologists. Many of the most crucial topics dealing with creating environments suitable for life are covered, including nebulae and star formation, fusion-synthesis of the biogenic elements, and stellar habitable zones. Section 5, ‘When the Universe Turns Bad’, takes a slightly more macabre tack and lists all the ways the cosmos is out to kill us, with Tyson describing the threat posed by everything from asteroid impacts to nearby supernovae. In another chapter Tyson looks into the possibility of life surviving on rogue planets wandering through the cold depths of interstellar space; wanderers gravitationally ejected from their home star system. Geothermal reservoirs can last billions of years, so perhaps life can survive even in these most unlikely worlds deep beneath the frozen surface. Tyson also notes that following the rules of Latin genitives, any aliens inhabiting the planet Venus (such as drifting through the cooler cloud banks) ought not to be called ‘Venusian’ but ‘Venereal’. He notes, however, that since medical doctors assumed this word first for another meaning entirely, it’s probably best not to push the point. I thoroughly enjoyed reading Death by Black Hole, and have certainly learned a great deal in the process. The chapters work very well as stand-alone pieces, perfect for dipping into every now and then, and the book is well-organised to provide a smooth structure overall.